Do you have what it takes to time travel to Austenworld? Take the quiz and find out--and you also just might win both Austen Addict novels! Rude Awakenings of a Jane Austen Addict in the UK AND Italy. Today the post brought a lovely surprise: my author copies of the new Italian edition of RUDE AWAKENINGS OF A JANE AUSTEN ADDICT, a/k/a IN VIAGGIO CON JANE AUSTEN, published by Sperling & Kupfer. Check out the fun cover. Bellissima! Meanwhile, RUDE AWAKENINGS has also recently debuted in the UK, thanks to the fabulous Bloomsbury. Love the drawing of Jane in full Regency get-up in the middle of Hollywood. Ciaio, and have a lovely weekend! 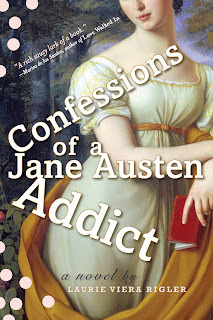 Leave a comment at forromancereaders.com for a chance to win copies of CONFESSIONS OF A JANE AUSTEN ADDICT and RUDE AWAKENINGS OF A JANE AUSTEN ADDICT (just published in the UK! ), courtesy of the good people at Bloomsbury.